Australia experienced its third warmest year on record in 2014 with an Australian annual national mean 0.91 °C above the average. Autumn was also the third warmest on record and Spring set a new national record for average temperature. 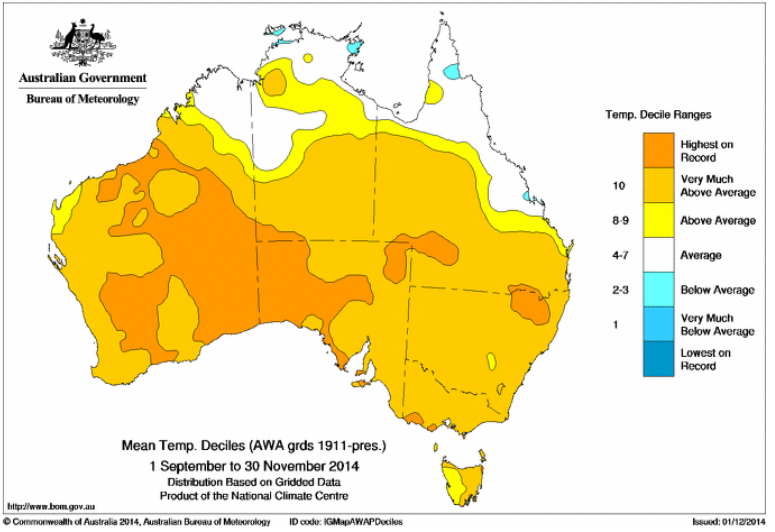 It was also the warmest year on record for New South Wales (0.04 °C above the previous record set in 2009), the second-warmest for Victoria, Tasmania and South Australia, equal-third-warmest for Queensland and fourth-warmest for Western Australia. Maximum temperatures were 1.16 °C above average, and minimum temperatures 0.66 °C above average. 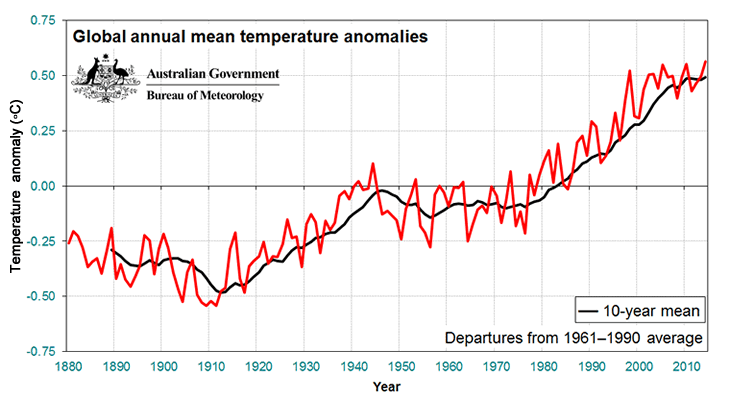 The annual mean temperature was the second-highest on record with an anomaly of +1.28 °C, behind +1.29 °C recorded in 2013. Peter Hannam in the Sydney Morning Herald notes that Sydney had a record warm year with few cold spells. "Last year was the city's equal warmest for overnight temperatures and its second-warmest for means and maximums in 156 years of record keeping at Observatory Hill." One week into the New Year and the Victorian Department of Health has now issued two Heat Health alerts for Melbourne (Victoria's Central region), as well as for other regions. Globally, provisional data by The World Meteorological Organization (WMO) estimates that global mean temperature for 2014 based on the average of three global surface climate datasets was likely to be the warmest year on record. The Japanese Meteorological Agency also says that 2014 is the warmest year on record, with the Five Warmest Years in terms of Anomalies being: 1st. 2014(+0.27°C), 2nd. 1998(+0.22°C), 3rd. 2013, 2010(+0.20°C), 5th. 2005(+0.17°C). Spring 2014 was Australia’s warmest on record (Figure 1, Table 1). Seasonal mean temperatures, averaged nationally, were 0.1 °C warmer than the previous record set just 12 months ago, during spring 2013. Temperatures were 1.67 °C above the 1961–1990 average, the largest such departure from the long-term average observed since national records began in 1910. The previous record positive seasonal departure, set during autumn 2005, was 1.64 °C above the average. The Australian area-averaged mean maximum temperature was +2.76 °C above average during October, resulting in the largest October maximum temperature anomaly on record and the fourth-largest positive maximum temperature anomaly for any month in 105 years. The earliest above-45 °C day ever recorded in Australia occurred on 9 October when Bidyadanga, in the west Kimberley of Western Australia, observed a record high of 45.2 °C, exceeding the previous October record for this site of 43.8 °C observed on 14 October 2007. 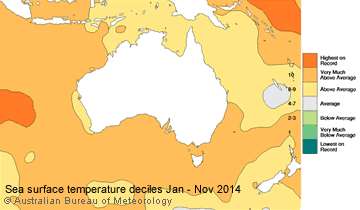 Prior to this, a temperature greater than 45 °C had not been reported anywhere in Australia before 21 October. November was marked by two significant heatwaves that saw record high temperatures in the Northern Territory, South Australia, New South Wales and Queensland. Alice Springs had a record high temperature of 44.9 °C, surpassing the previous November record by nearly 2 °C. Widespread flying fox deaths were reported during Spring heatwaves, with more than 5000 reported dead in Casino and 2000 in the Richmond Valley. Rainfall was above average for far north Queensland, much of the Northern Territory, inland Western Australia and parts of South Australia. In the South the western coast of Western Australia and over much of the eastern States had rain deficiencies. "Annual rainfall totals were in the lowest 10% of observations for most of western Victoria and adjacent southeastern South Australia as well as parts of coastal Tasmania, small areas in northeastern New South Wales, southeastern Queensland and central Australia. 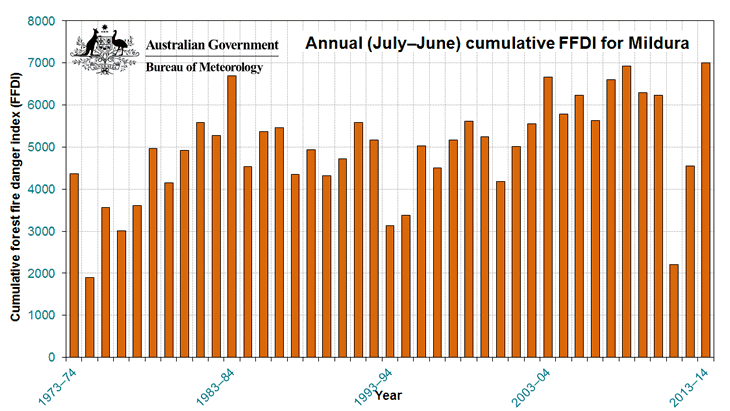 Victoria's annual rainfall has been below average for 15 of the last 18 years (1997–2014); only 2000, 2010 and 2011 observed above-average rainfall during this period, with each of these three years affected by La Niña." says the report. The 2014 rainfall pattern "reinforce the pattern of recent decades, with above-average rainfall during the peak of the summer monsoon season and below-average rainfall during the cooler half of the year." One of the reasons south west Australia and south east Australia is seeing a drier trend is due to climate change causing Westerly winds to speed up and contract south, especially reducing winter rainfall. 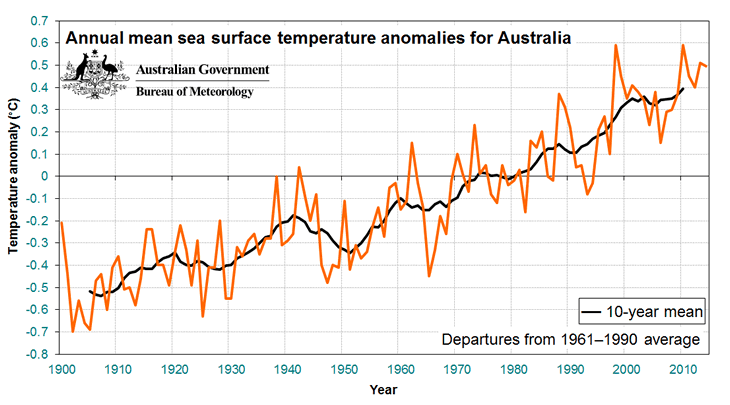 Sea surface temperatures around Australia remain high. "The preliminary rank for 2014, based on January–November data, places the annual SST anomaly as the fourth-highest since 1900, 0.49 °C above the 1961–1990 average." June, September and October were the warmest temperatures on record for the southern region, but monthly anomalies for all months since April were within the top four. Australian region sea surface temperatures have increased by approximately 1 °C since 1910, very similar to the increase in temperature over land. In November the UK Met Office reported Record global sea surface temperatures in October. It is not just sea surface temperatures, research shows that Ocean Heat Content to 2000m continues warming. The high temperatures in Spring helped dry out vegetation and also lead to increased fire danger across south-eastern Australia. Dry fuels, combined with high temperatures and strong winds, led the Tasmania Fire Service to issue a total fire ban on 28 September, the earliest for the season since 1987. During the last days of October and first days of November a large number of bushfires occurred in Queensland and New South Wales, including large fires in Queensland at Ballandean, near Stanthorpe; at Hookswood, north of Miles; at Ravenshoe, inland of Innisfail; and at Ravensbourne, northeast of Toowoomba. In New South Wales, a fire in the Blue Mountains destroyed a house near Katoomba. lightning on the 23rd contributed to around 90 fires in New South Wales. Lightning on 15 December started several significant fires in central and northeastern Victoria, inland of the Great Dividing Range. The four most significant were the 3500 ha Stewarton fire, northwest of Benalla; a 120 ha fire at West Wodonga; the 6800 ha Lake Rowan-Crawbys fire, between Benalla and Yarrawonga; and the 6500 ha Longwood-Creightons Creek fire south of Euroa. One should note that the Bureau of Meteorology suffered Cuts of $10 million over 4 years to it's budget in the 2013/2014 Federal Government Budget.